Growing tomatoes from seed isn't hard, but there are a few things to be aware of. If you peruse a seed catalog, especially one geared toward heirloom vegetables, you’ll quickly realize that the selection of tomato transplants in nurseries pales in comparison to the variety of seed that are available. Names like ‘Aunt Ruby’s German Green Tomato’ and ‘Missouri Pink Love Apple Tomato’ have been ascribed to varieties whose flavor and appearance are as eclectic and unexpected as their names imply. Growing from seed gives you the chance to experiment with some of these more unusual varieties. Growing tomatoes from seed isn’t hard, but there are a few things to be aware of. As with all things agrarian, timing, genetics and environment have to be in alignment to reap the rewards of your efforts. 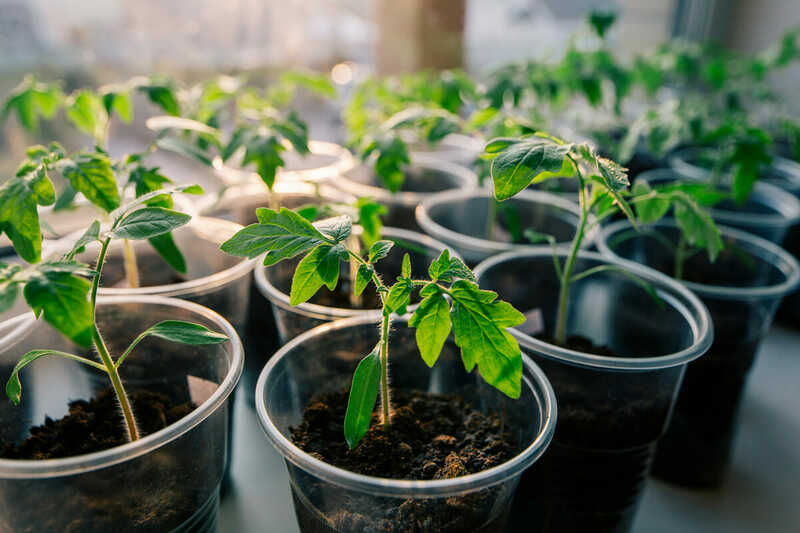 Tomato seeds are almost always started indoors – whether in a greenhouse or a sunny window ledge – and then transplanted to beds once they have at least a few leaves and an established root system. Starting seeds indoors is optional with many vegetables, but tomato seeds need a constant soil temperature of at least 60 degrees, and preferably 80 degrees, to germinate. In temperate climates, it may be midsummer before the soil gets that warm, and by then it’s too late for tomatoes to grow and mature before the end of the growing season. Tomato seeds are typically started “six to eight weeks before the average date of last frost,” as the seed packets so ubiquitously state. Tomatoes originate deep in the tropics; temperatures below 32 degrees Fahrenheit are their death knell. And because they take three months or so to produce ripe fruit, most gardeners want to get the process started early. So how do you know when your average date of last frost is? In the past, you might have consulted the Old Farmer’s Almanac. Today there are many websites that can tell you, including Modern Farmer’s own quick and handy frost chart. To give you an idea of the range: in Savannah, Georgia, it’s March 1; in Bozeman, Montana, it’s May 26. Find yours, subtract six to eight weeks and plant your tomato seeds. ‘Soilless’ potting mix (available at any garden center) is the medium of choice for sowing tomato seeds, though you can opt for the more expensive ‘seeding mix’ if you want. As for the container, cell packs (the tiny plastic pots grouped together in packs often used for flower and veggie seedlings) are OK for starting tomato seeds, but a better idea is to use a small pot at least 3 or 4 inches tall and wide so the seedlings can grow to a healthy size without their roots being constricted. Fill the pots with potting mix to within a 1/2-inch of the top and place a pair of seeds on top of the soil in each one near the center of the pot (having two is good insurance in case one doesn’t sprout. Pinch off the smaller, weaker of the two if they both sprout). Cover them with a ¼-inch layer of soil mix and the compress the soil with your fingers. Good seed-to-soil contact is important for germination. Sprinkle water on the seeds whenever the top of the soil mix appears dry. Don’t keep the soil soggy, however – the seeds may rot. The seeds will need a sunny window with at least 4 hours of direct sun each day, but preferably more. Also: the warmer it is, the faster tomato seeds will germinate. Maintaining room temperature above 60ºF will get the job done, but there are also seedling heat mats, heat lamps and many other tricks that farmers and gardeners have concocted to speed up the process. A simple approach is to cover the pots tightly with plastic and take advantage of the greenhouse effect to warm up the soil when the sun is out and hold on to the heat at night. There is an important caveat about tomato seedlings and mini-greenhouses: If you’re covering your seeds to keep them warm, you must remove the cover as soon as they start to germinate. Otherwise, they may succumb to damping off disease, a fungal infection that proliferates in still, moist air. This appears as brown and grey spots on the leaves followed soon after by the death of the seedling). Damping off is a big challenge with tomato seedlings in general, so try to provide good air circulation during their infancy period indoors. A tiny fan or heat vent nearby is helpful, as is an open window from time to time (but only when outdoor temps get up to room temp). There are thousands of tomato varieties, but they all fall into a few broad categories. A single plant may produce scores of tomatoes over the course of the season, so you may want to strategize and plant one or two from each of the main categories. Cherry tomatoes, such as Sun Gold, Napa Grape and Pear Drops, have the quintessential sweet-tart tomato flavor and are great for salads and snacking on whole. Because the fruit is small, these are the first to mature. Sauce tomatoes, such as Roma, Amish Paste and Big Mama, have a richer flavor and much lower water content than other varieties. They’re the best ones for spaghetti sauce. Beefsteak tomatoes, such as Mortgage Lifter, Cherokee Purple and Brandywine, have the biggest fruit and the greatest range of flavor and form. They are commonly sliced for sandwiches or making caprese salad, though the best varieties can be eaten like an apple. There are also many all-purpose tomato varieties that have traits from each category. Most of the round, tennis ball size tomatoes at the supermarket would be classified as all-purpose. These are usually modern hybrids that rarely match the complex flavor – and diverse appearances – of heirloom tomatoes. Finally, there is one often overlooked tomato trait that is quite important to be aware of. Somewhere on the seed packet in fine print you may find the words “determinate” or “indeterminate.” The former means the plant will grow to a certain, genetically determined size and then stop (the packet should indicate the size). The latter will grow indefinitely, as long as freezing temperatures or other acts of nature (or humans) don’t stop it. Few people realize that in their tropical homeland, tomatoes are actually perennial vegetables, meaning they grow year after year, not for just one season. In the tropics (or here, in a greenhouse) indeterminate tomatoes eventually become vines more than 20 feet long. The practical ramifications for North American growers are that indeterminate tomatoes need much more space – they can easily grow 6 or 8 feet in a six-month growing season before succumbing to frost. If you want a compact tomato plant that fits inside a standard 3- or 4-foot tomato cage, go with a determinate variety. You will get more tomatoes overall with an indeterminate variety, but determinate varieties typically yield more fruit per square foot. Planting tomatoes according to the local date of last frost is a no-brainer. But if you want to get metaphysical about it, consider the position of the moon and stars. Biodynamic growers are highly attuned to cosmic influences in agriculture and plant according to a yearly calendar based on celestial events. Farmer’s almanacs have traditionally been based on the same phenomenon. For example, the current Farmer’s Almanac says that March 24 and 25, 2015, are terrible times for planting any seeds, but recommends April 3 for tomato planting in particular. Join us again in early May for part two of the series, where we’ll lay out the finer points of “hardening off” the seedlings, preparing the soil and providing your sensitive seedlings with just the right juju to grow lavishly and fruitfully through the summer.